Traffic monitoring is a must for IT administrators these days, and an integral part of most enterprise networks. There are many different approaches to getting visibility into the network, but using a TAP has proven to be the most accurate and reliable. Read more here about why a network TAP is better than a SPAN. Among all these network hardware devices, Aggregation TAPs are extremely important. Enterprise networks are more and more complex, having now the ability to transfer incredible amounts of data. This, in turn, makes monitoring and analysing more complicated. To be sure the right (and actionable) data arrives at the right Out of Band and In-Line devices for monitoring purposes, you need NPBs to filter and broker the data at high speed to the right ports. These advanced monitoring devices however, are expensive, and their ports fill quickly. 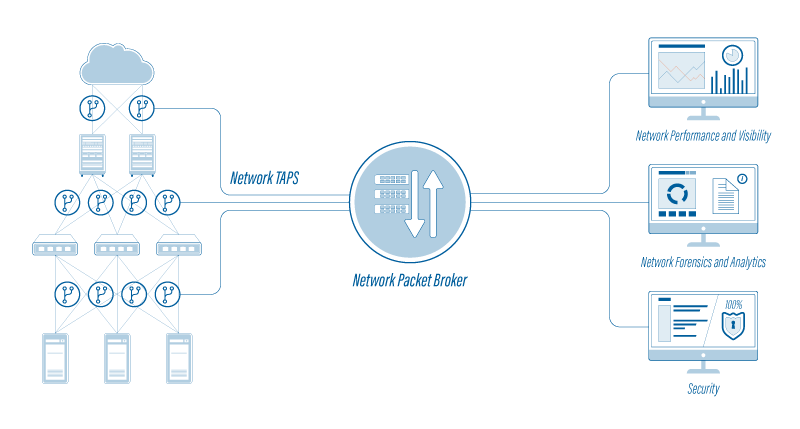 To make use of Network Packet Brokers in a more efficient way, Profitap has developed a range of Aggregation TAPs to help you save valuable space on your packet brokers and money on your IT infrastructure. Aggregation TAPs improve your monitoring systems’ density by connecting MANY network ports to ONE monitoring port (M:1). Combining two or more incoming traffic streams into a single flow of outgoing traffic, they reduce the number of monitoring ports. What’s so special about the Profitap Booster? If you are using a 1Gbit/s aggregation TAP with a 1Gbit/s aggregated output link, the total bandwidth can be as large as 2Gbits/s, over-burdening the TAP and leading to dropped packets. That's where our Booster Aggregation TAP comes to rescue by helping you avoid these dropped packets. As you know, 4 basic aggregation TAPs use 8 ports (4 in-line links), but when adding one of our Boosters to the system you reduce this number down to 1. And since it aggregates 8 x 1 Gb/s to a 10 Gb/s output, it means a bottleneck of traffic flow is impossible. This allows your data to become more cost effective and time efficient with no concern for the delays or dropped packets. Our signature Aggregation TAP - the Booster - is a high-density traffic aggregation tool you can pair with a Network Packet Broker to optimize the number of ports used on it. As said before, Network Packet Brokers (NPBs) are a vital but highly expensive investment for a data center. Thus, each and every one of an NPB’s ports is invaluable. That's why pairing it with Profitap's Boosters provides unprecedented savings, and adds functionality to your network monitoring infrastructure. Moreover, our Booster In-line has a fail-safe circuitry built-in. if the device losses power, the relay circuitry will fail-close in 8 milliseconds, ensuring uninterrupted network operation. The Profitap Booster In-line, a Gigabit Copper Aggregation TAP, transmits traffic from up to 4 full-duplex 10/100/1G In-Line links into a single NPB port. In case of complete power failure, this device keeps the link up and switches to a fully passive mode, guaranteeing the network is operational at all times. It also supports link failure propagation (LFP). This means that the TAP is able to transmit link failure errors between ports, allowing the network to activate a redundant path, while the network TAP stays available for auto-negotiation. LFP ensures less downtime and is essential for high-availability networks. Discover the benefits of link failure propagation here. The SPAN model aggregates traffic from up to 8 x SFP SPAN 1G ports into 1 SFP+ 1G-10G output. A rack-mountable device, the Booster Span is designed by our team of highly-skilled engineers to optimize the number of ports used on your monitoring system. Both of these Aggregation TAPs provide a significant reduction in occupied rack space, being able to aggregate and forward any packets from 50 Byte to 10 KByte, including CRC error packets. This next-generation Aggregation TAP paired with an NPB makes it possible to monitor all data center network traffic in a cost-effective way, without losing any packets. In the same time, they help you capture and analyze only the traffic that you need.